OK, I am going to start this post with a very short introduction. It’s going to be about all things ‘Ladies Time of the Month’, so, if this isn’t your bag, you don’t want to know, I’d encourage you to click on something a little more up your street! OK, so now we have that out of the way, let’s talk all things periods. Don’t worry guys, I’m not going to get into all things biological, or even all things gross, it’s going to be all things moon cup! Yes, you guessed it, I have become a mooncup convert. I’m not out to convert you all too (or am I?) but I’ve decided that it’s finally time to talk about it. First things first, I’m not someone who can time when they come on to the hour in a particular day (annoyingly) so I always used to carry round spare pads and tampons just in case it struck from nowhere. I’m also not someone who could say with any certainty how each time would go, how many days it would last etc, so it always meant that I needed (to feel comfortable) to have a stockpile of spare sanitary products. I even took to making sure there was a spare supply in my work box, my car, and my handbags. Let me tell you, this is not cheap. I’m sure all of the women reading this will be sitting there nodding with me. They may not cost that much per pack, but if you’re buying a pack or two of pads and/or tampons every month or so, it adds up. Now, I don’t want to launch into the whole tampon tax debate because that is another rant for another day, but it all adds up. I am not gonna lie to you all, I do begrudge paying it to a certain point, but it’s not a luxury, and it’s not something I am going to live without, so for over a decade, I lived and lumped it. That was until the summer of 2017. I’d heard friends, bloggers, vloggers, and reviewers talking about the moon cup. At first, I was so incredibly sceptical about the whole idea of it that I brushed it aside completely for months, no, years. And then Emma mentioned that the vlogger Hannah Witton had been trialling their use and documenting it all on her YouTube channel. I was absolutely engrossed in her vlogs, and decided to watch another few YouTubers. All of their efforts fascinated me, and were making me think that it might be the time to give it ago. So, after careful investigation, lots of watching videos and reading articles, I decided to take the plunge. After investigating the different makes and the pros and cons of different types, I bought the Type A moon cup. When it arrived, I looked at it and thought about forgetting the whole idea. It just seemed a bit ridiculous, and the instructions were barely making sense when I attempted to put them into practice. It took a couple of gos, and a couple of trials and errors as to technique, but I got there. I haven’t looked back since. The investment made was about £16, and they say it only needs replacing once every 10 years, so it doesn’t take a genius to realise that it quickly pays itself off. I was thinking of the amount spend on sanitary products since I have required them, and don’t think I’d be underestimating if I said it was in the £100’s, so financially it is a no brainer. Exercise without any worry of leakage – I love swimming, but before haven’t ever braved going into the pool when I am on my period, so this is a huge deal for me. I’ve worked out, done exercise classes, swam, and participated in an aquacise class and it’s worked without fail every time. 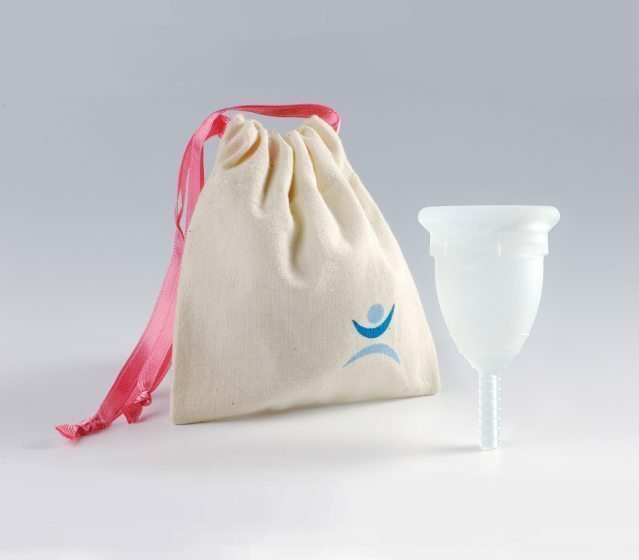 Carry it with me wherever I go – The moon cup comes with a little carry bag so I can slip it straight into my bag and carry it with me wherever I go. Nice underwear all the time – *Touch Wood* I have not had a single accident in the 6 months I have been using the moon cup for. This means six months of knowing that I can wear my nice underwear, six months of not worrying if I was wearing white or some other light colour, six months of not worrying about what I was wearing! Money, and convenience when shopping – I’d be lying if I said that this wasn’t a big factor, but having more money is always a nice thing. What’s better? Having the money in your account AND not having to go down the lady aisle for 10 years straight. Less waste – Guys, I’m not an environmental warrior by any stretch of the imagination, but, it’s nice to know that something that works for you is also good for the environment. I don’t like dealing with the by products of being on my period, and I don’t miss not having to throw away all of the rubbish. Patience – I don’t want to pretend like the getting to know you period is plain sailing. There is a little bit of jiggery pockery, and a little bit of finding the best angles and methods for you. Once you’ve got the knack, it doesn’t go! Handling the contents – I’ve avoided saying anything to graphic so far, but, if you’re bleeding all day the silicone cup is obviously going to fill. There does have to be a level of comfort with this. You need to be OK with the fact you may get a little bit on your hands, you need to be comfortable with seeing the contents when you empty it. Comfortable with your body – These devices are not for those who do not feel comfortable with the workings and the parts of their own body. You have to know your body, how it works, and be comfortable to touch and explore yourself to make sure everything works and fits. It can also be a good way to become acquainted and comfortable with yourself too. Public bathrooms – When you’re in the comfort of your own home, with a sink or a shower stall right there, it’s easy to rinse the cup and your hands. If you’re in a public bathroom, where the sink is outside the stall, then cleaning the cup out or washing your hands becomes that bit harder. Now, I personally just make sure I have a bottle of water handy, and it does the job, or just make sure I change/clean it before work so I can last until after but that’s just me. Have you given it a go, or have you thought about trying it? Haha, I know what you mean about trust so sounds like you have a plan!! I’ve seen those on Facebook but haven’t heard about them in practice! You literally can’t feel a thing, and nothing sticks out, if it does then you can trim the nubbin a little to the perfect length. It’s soft silicone so it’s malleable and just fits to you, it’s honestly not that big. They apparently last for 10years, hopefully!! I know they’re not for everyone but I can’t recommend them enough!! Ok, I’m less squeamish about them now. I imagined them to be quite…solid? One of my friends said she really struggled but apparently you can get them in different sizes? Thank you for your honesty, sorry if I asked anything too personal! Ok, I’m more on board with the whole idea now. I’m still not sure it’s for me, but it’s definitely something I’ll think about. Thank you for being so helpful!